The lecture touched upon the growth of the practice of international arbitration, the public policy provision of the New York Convention, and the unfortunate backlash against the use of Investor-state dispute settlement (ISDS) clauses for investor-state disputes. Schwebel served in the Office of the Legal Adviser of the U.S. Department of State, was a member of the United Nations International Law Commission, and was a Judge of the International Court of Justice. Schwebel is the third lecturer in the International Arbitration Institute’s lecture series, which is marking one year since its inception. For the Schwebel lecture panelists included: Bernard Oxman, the Richard A. Hausler Professor of Law and Faculty Chair of the Master of Laws Program in Ocean and Coastal Law; Carolyn Lamm, JD ’73, Partner at White & Case LLP and visiting professor at Miami Law; and Marike Paulsson, director of the Institute and Lecturer in Law. 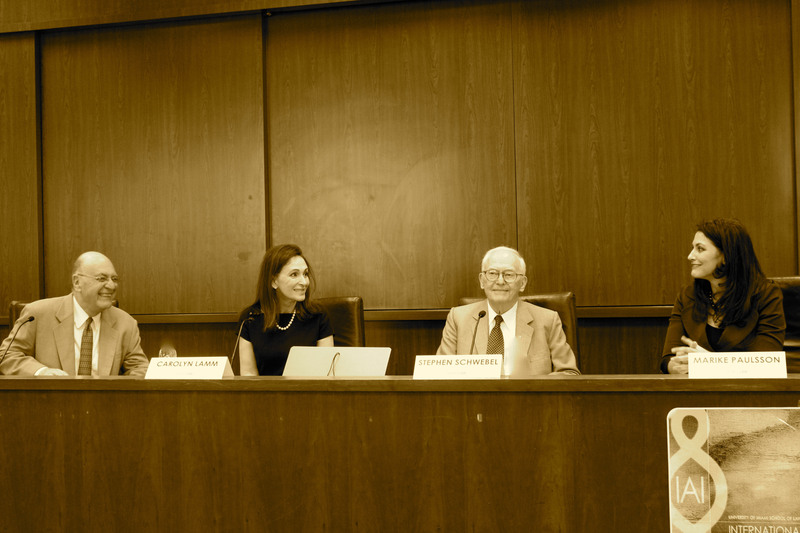 At the close of the lecture, Schwebel was inducted as an honorary member of the International Arbitration Institute’s faculty, following his honorary University of Miami degree bestowed on him in 2010 by President Donna Shalala. “Steve is truly someone in the international arena who has done it all and done it to perfection,” said Carolyn Lamm, member of the Institute’s leadership team.